Redland City Council’s Economic Development Advisory Board has taken the first steps to formulate action plans to grow the City’s key industry sectors. Redland City Mayor Karen Williams welcomed the board meeting formally for the first time and getting down to business and the appointment of the sixth board member Sirromet Managing Director Terry Morris. “It’s an exciting time for the Redlands as we are on the cusp of realising strong growth,” Cr Williams said. “We have $1.4 billion investment on the horizon through the redevelopment of Toondah Harbour, plus about $50 million worth of building and civil works in the pipeline approved by our City Planning and Assessment team. “Now that our Economic Development Advisory Board is down to business, the group will ensure strategic advice is being presented to Councillors so we can play our part to support the local economy and create jobs. Redland City Council’s Economic Development Advisory Board is getting down to the business. 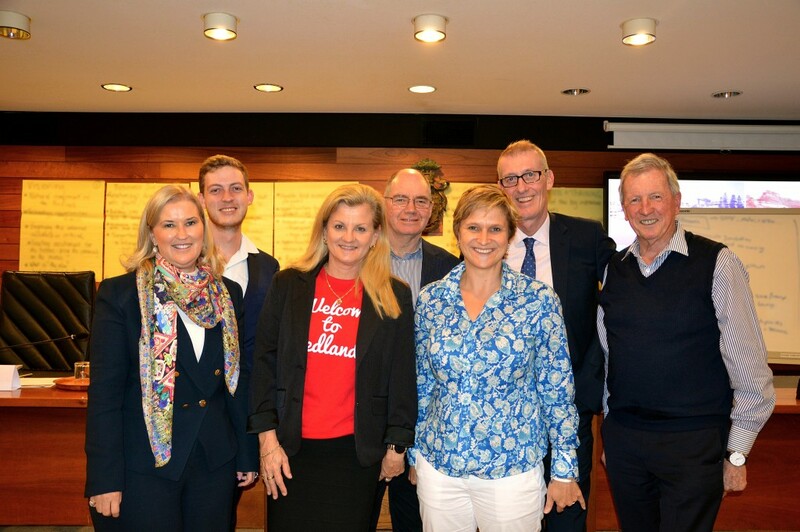 The six-member board (pictured back from left) Jordan Duffy, Dr John O’Donnell, Jerry Harris, Terry Morris, (front) Catherine O’Sullivan and Samantha Kennedy held their first board meeting on Thursday 23 June and caught up with Redland City Mayor Karen Williams (front centre). The Economic Development Advisory Board is responsible for leading the implementation of the Redland City Economic Development Framework 2014-2041. Cr Williams said the group will deliver tangible economic action plans for the Redlands’ key industries and chart a course to achieve the framework’s ultimate objectives of 30,000 new jobs and increasing the city’s gross regional product to $6.8 billion by 2041. Economic Development Advisory Board Chair Samantha Kennedy said the group took the first steps to formulate action plans for the health care and social assistance; education, innovation and training; and manufacturing sectors last week – the top three industries with the potential to be wealth and employment generators for the local economy. “We have started the journey to understand the challenges and opportunities for businesses in the Redlands in order to create action plans to present to Council to spur on growth and prosperity,” she said. “A potential action all board members supported at our first meeting was to work on a vision project for the Redlands to clearly articulate the region’s economic strengths and unique identity. “Another idea was to immediately start work on helping to improve internet reliability for local businesses. “Having worked in the information, communication and technology sector for the last 12 years, I understand how important it is for businesses to have good internet access. The other four Economic Development Advisory Board members are adjunct professor and Mater Health Services Chief Executive Officer Dr John O’Donnell, Bond University Pro Vice Chancellor Catherine O’Sullivan, media executive Jerry Harris and innovation adviser Jordan Duffy. To view the Redland City Economic Development Framework 2014-2041 click here.